8 boned and skinned canned sardines, in olive oil. 8 oz of ricotta cheese. 1 teaspoon of curry powder. ¼ cup of fresh parsley, chopped. 2 tablespoons of capers, rinsed and drained. Crisp crackers, to serve with. Drain the olive oil from the sardines and discard the tails. In a food processor, combine the fish with the ricotta cheese, curry powder, parsley, capers and lemon zest; process until a coarse spread forms. 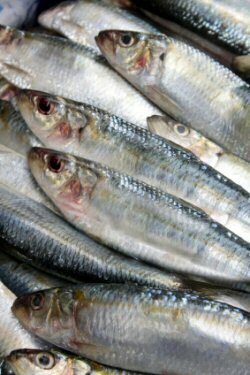 Back to the Sardine Recipes home page. View a free printer friendly PDF version of this recipe. Created your own sardine recipe? Submit it to this site and our food and drink network.